Winner, Best Advocate award, 15th S.C. Javali National Memorial Moot Court Competition, 2012. 2nd Runners-Up , 2nd ILNU International Moot Court, 2013, organized by the School of Law, Nirma University, Ahmedabad, Gujarat. Won Special Mention award in BVP MUN 2014, Delhi. 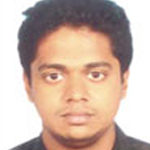 Won Special Mention award in IIIT Bhubaneswar MUN 2013, Bhubaneswar, Odisha. Won Best delegate award in GEC MUN 2013, Bhubaneswar, Odisha. Won High Commendation award in ISM DHANBAD MUN, 2013, Dhanbad, Jharkhand. Best Adjudicator, Chanakya National Law University National Parliamentary Debating Championship, 2012, Patna, Bihar. Quarter-finalist, 1st Rizvi Law College International Law Moot Court Competition, 2012, Mumbai, Maharashtra. Runner up and Best Written Submission in the 1st National Model Directors Meet organized by New Law College, Bhartiya Vidyapeeth, Pune. Quarter-Finalist at the “4th Jamia Millia Islamia National Moot Court Competition” (Jamia Millia Islamia, New Delhi – 12th-15th April, 2013). Secured 5th Position at the “11th Amity Moot Court Competition, 2012” (Amity Law School, New Delhi – March 2- 4, 2012). Semi Finalist at the “1st ILNU Moot Court Competition 2012” (NIRMA University, Ahmedabad – 13-15 April 2012). 3rd best written memorial (16th All India ULC Moot Court Competition, 2012). Secured 3rd position at the “Law Vision-National Moot Court Competition” organized by Dr. Ambedkar College, Nagpur, 24th Feb. to 27th Feb, 2011. Semi Finalist at the “Law Vision- National Moot Court Competition”organized by Dr. Ambedkar law College, Nagpur)– 3-5 March, 2010). Winner, 3rd Best Memorial and Quarter-Finalist At The 51st Philip C. Jessup International Law Moot Court Competition (Lucknow – 15th To 17th January 2010). 24.01.13 Interacted with Mr Chintamani Mohapatra, Chairman, American Studies Program, JNU on the subject Indian Foreign Policy. 06.10.12 Interacted with Mr Justice A K Pattnaik, Judge, Supreme Court of India on the subject Right to Education under Constitution of India. 22.09.12 Interacted with Mrs Justice Gyan Sudha Mishra, Judge, Supreme Court of India on the subject Social Justice – Problems and Challenges. 28.07.12 Interacted with Mr Justice Dipak Mishra, Judge, Supreme Court of India on the subject “Social Justice, Judicial Activism and Role of the Supreme Court of India”. 1st Position in ITM Law School National Essay Writing Competition, 2011 organized by ITM Law School, Gurgaon, on the topic “Adequacy of Legal and Regulatory Framework to Combat Corruption in India”. Competition-2012 in Oct-2012 at Sir Siddapa Kambali Law College, Dharwad, Karnataka University. Also won the Best Gentleman Advocate Trophy. Quarter Finalist in the 21st Kerala Law Academy Moot Court Competition, 2011. Semi Finalist in the 13th S.C. Javali National Moot Competition, 2011 held at University College of Law, Karnataka University, Dharwad. 1st runners up in the 2nd R.K. Jain Memorial National Moot Court Competition, 2011 held at Vivekananda Law School, GGSIP University, Delhi. Six students of 2nd Year of School of Law, KIIT University have won the Inter College Competition for world Environmental Day and presented their view on the Environment Protection Act, 1986 (R L E K), Dehradun. 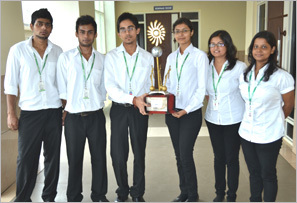 (Students-Abhimanyu Singh, Abhishek Aditya, Pratik Arihant, Niharika Vaid, Pritha Chakrabarty and Amrita Anushka). 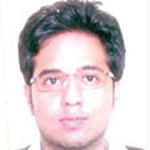 Alipak Banerjee, BBA.LL.B 5th Year, won Best Abstract Award in 2nd Symbiosis International Legal Essay Writing Competition, 2010 organized by Symbiosis Law School, Pune. He won Gold and Silver Award in S. N. Gupta & Co, Advocates and Legal Consultants, Best Article Award Competition consecutively for 3rd & 4th Quarter 2009. He also represented KIIT in Phillip C. Jessup Moot Court Competition, 2009 and won 3rd Best Memorial Award. 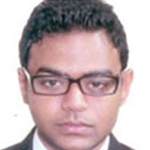 Alipak Banerjee completed internship in law firms of international repute including Amarchand & Mangal Das & Suresh A Shroff & Co, New Delhi; Khaitan & Co LLP; Freshfields Bruckhaus Deringer LLP; Prof. J Martin Hunter, Essex Court Chambers and London Court of International Arbitration, London. 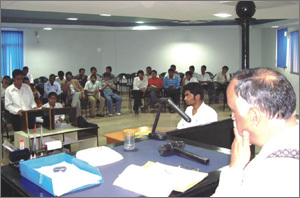 Alipak Banerjee represented KIIT and secured 2nd position in National Law Fest – Moot Court Competition, University Law College, Utkal University during 22nd – 23rd November 2008. He was a Semi finalist in K.L.E Society`s Law Academy National Law Fest – Moot. Court Competition, 27th, 28th and 1st March. 2009. He has several publications in national and international journals to his credit and has extensively presented papers in reputed national and international conferences. Nidhi Singh, 3rd Year BBA.LL.B, presented a paper entitled “Barriers of Investing in Clean Energy Alternatives in Asia” at the 3rd Annual Harvard Project for Asian People and International Relations from 18th-21st February, 2010. She also attended a four-day workshop conducted by the Harvard Law School students on ‘Negotiation’. The conference attracted participants from all over the world. Nidhi Singh, 4th Year BBA.LL.B, attended the 8th Annual Session of The Oxford International Model United Nations, hosted at The University of Oxford from 29th to 31st October 2010. She was selected as a delegate on the International Court of Justice (ICJ) Committee to act as judge in one of the case and as an attorney for the other case. She received an Honourable mention at the closing ceremony of the conference acknowledging her commendable performance. Nidhi Singh, 5th Year BBA.LL.B, participated in the “Liberty and Leviathan” Summer Seminar organized by the Institute of Humane Studies at George Mason University, Washington D.C., USA from June 3rd-June 10th, 2011. The Institute for Humane Studies provided her $ 1000 scholarship to cover her tuition fees and accommodation. is Working as a Research Assistant for London School of Economics, U.K. and Columbia University, U.S.A. He has done internship under Mr. Ram Jethmalani, Eminent Advocate and former Law Minister, Hon’ble Mr. Justice G. S. Singhvi, Judge, Supreme Court of India and in Duane Morris & Selvam, Singapore. He has several publications in various journals of national and international repute to his credit. a student of the School of Law, KIIT University, received the Justice K. M. Subhan Memorial Best Mooter Award from Mr. M. K. Rahman, Sr. Advocate & Additional Attorney General, Bangladesh and Mr. M. Mohsen Rashid, Advocate, Supreme Court of Bangladesh on 25th December 2010 in Dhaka. a 4th Year student of KIIT School of Law, interned in London, Essex Court Chamber under the supervision of Prof. J. Martin Hunter for a period of 8 weeks, from 28th May to 19th June, 2011 and from 27th June to 26th July, 2011. 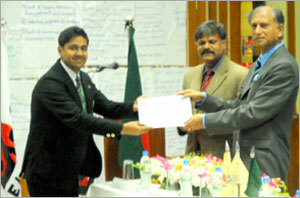 Sumit Kumar Jaiswal from School of Law, KIIT University receiving the Justice K. M. Subhan Memorial Best Mooter Award from Mr. M. K. Rahman, Sr. Advocate, Additional Attorney General for Bangladesh and Mr. M. Mohsen Rashid, Advocate, Supreme Court of Bangladesh on 25th December 2010 at Dhaka. 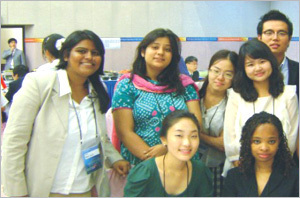 Nidhi Singh, a student of third year B.B.A.L.L.B, represented India at the 20th International Youth Forum 2009 held in Seoul, South Korea. The seven-day conference attracted as many as 120 foreign delegates form 33 different counties. The Conference was held in the form of Model United Nations based on the theme “Climate Change and Green Growth”. She also presented a paper in one of the sessions and chaired the General Assembly Session negotiating the Youth Deliberations. Tabrez Malawat, Jitendra Soni, and Swarnendu Chaterjee were awarded “Best Memorial” at the Commomwealth International Law Moot Court Competition 2009 organized by The Commonwealth Legal Education Association (CLEA) under the auspices of School of Law, Christ University Bangalore from 19th to 22nd February 2009. The team of students from second year and third year of KIIT School of Law namely, Soumyajyoti Biswal, Kanad Bagchi, Jitendra Soni, and Alipak Banerjee won the “Third Best Memorial Award” at the North India round of Phillip C. Jessup Moot Court on International Law organized at Dr. Ram Manohar Lohia National Law University, Lucknow from January 15-17th, 2010. The team also went to the quarter finals. A team of students from KIIT School of Law (KSOL) participated in a prestigious international Moot Court organised in Hong Kong. It is a rare honour for KSOL to participate in this academic event along with other reputed law schools from across the Globe. The Moot Court, as is well known, is a field for advocacy of ideas. In the 3rd Annual Harvard Project for ‘Asian people and Clean Energy Alternatives in Asia’ held from 18th to 21st February, a 3rd year student, Nidhi Singh was adjudged as the best delegate from amongst the 150 participants from all over the world including the Universities of Oxford, California, Los Angles, Chicago, Boston, Auckland, National University of Singapore, Nanyang Technology University, Singapore, NLSIU Bangalore, lIT Kharagpur and MIT, USA. Ankita Bafna, Alipak Banarjee, Tabraz Malawat, Jitendra Soni, Kanad Bagchi, Somyajyoti Biswal and Divyashru Baxipatra, students of KIIT School of Law, participated at 18th William C. International Commercial Moot Court Competition, 2011 held in Vienna, Austria. Mayuri, Akriti Sarkar and Jaya Gowdhwani, students of KIIT School of Law finished Runners Up in R. K. Jain Memorial Moot Court Competition organized by Delhi University. Mayuri, Preran Dhoop, Alipan Chatterjee and Praveen Kumar, students of KIIT School of Law, won 4th Best Memorial Prize in 52nd International Jessup Moot Court Competition (North India Rounds). KIIT School of Law has started playing a key role in the policy making of the country. In a historic move, on the recommendation of KIIT School of Law, Election Commission has allowed transgenders and eunuchs to have the right to mention themselves as “others” in the gender box. 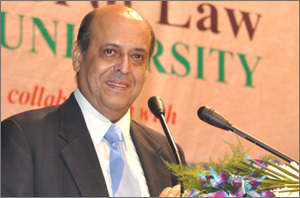 Mr. Navin B. Chawla, the (then) Chief Election Commissioner of India had delivered an extension lecture at KIIT School of Law , KIIT University on “Electoral Reforms in India” on 13th of January 2009. During the lecture, Mr. Chawla emphasized the need of achieving higher voting percentage and persuaded students to convince others to participate in the electoral process of the country. It was during this interactive session that Prerna Dhoop, Kanad Bagchi & Alimpan Chatterjee, second year law students of KIIT School of Law , Bhubaneswar raised the issue of the right to self-identification of transgenders and eunuchs. It was argued that nothing is closer to the “heart of liberty” and “central to personal dignity ” than an individual’s chosen gender identity to be granted full legal rights and protection against discrimination even if you do not fall into one of two neat societal boxes labelled male or female. In response to the questions, Mr. Chawla assured the gathering present that he would look into the matter. Inspired by such assurance the students of KIIT School of Law worked dedicatedly towards achieving the said rights for an already discriminated and ostracized community. The three students subsequently met Mr. Chawla in his office in New Delhi on 29th of May, 2009 to further press their views. It was heartening to see Mr. Chawla share their concern and had already initiated measures to redress such wrongs against a community. The efforts of these three students alongwith Mr. Chawla has borne fruit as the Election Commission after much deliberation has finally ascribed the ‘other’ identity to eunuchs and transsexuals on 12th of November 2009. This is a major development in the area of identity politics as now transsexuals can choose “others” as their identity and would no more be compelled to choose between the two genders – male or female. KIIT School of Law students have made their presence felt at various National Seminars and Conferences on the legal aspects of current issues. KSOL student was shortlisted to attend and present a paper in the technical session of International Academy of Law organized by World Council for Corporate Governance, in association with Ministry of Law and Justice, Government of India. KSOL students have participated in ILSA Conference,2009 held at NUJS, Kolkata; All India Criminology Conference, Srinagar; International Conference on Corporate Social Responsibility at NLIU, Bhopal; National seminar on Humanitarian Law, New Delhi. Students of KIIT School of Law have always been keen on developing their legal research ability. Various publications of national and international repute have acknowledged their research by publishing articles in their journals/periodicals. 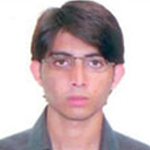 Alipak Banerjee, (B.B.A VI semester), bagged the Silver Medal for essay writing competition for S.N.Gupta & Company Essay Competition on Foreign Direct Investment in Real Estate,2009. In the 1st lexTech Pan -Asian Law & Technology Essay writing Competition, 2009 on Contemporary Converging Techno- legal Issues our student Sri Sourav Dan (B.Sc.L.L.B 4th Semester) ranked 2nd. Mr. Saurav Dan ranked 2nd in the 1st Lex Tech Pan-Asian (2009) Essay Competition held by GNLU on the topic “Open Source Software: Evolution of IPR-Copy right to copy left”. 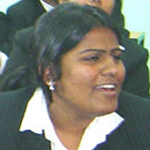 Nidhi Singh, a student of third year B.B.A.LL.B represented India at the 20th International Youth Forum 2009 held in Seoul, South Korea. The seven day conference attracted as many as 120 foreign delegates from 33 different countries. The Conference was held in the form of Model United Nations based on the Theme “Climate Change and Green Growth”. She also presented a paper in one of the sessions and chaired the General Assembly Session negotiating the Youth Deliberations. In Oct, 2009 KIIT University won the inter-university championship of Lawn-Tennis at Shaurya Fest organized by IIT, Kharagpur. Two students namely Sandip Mahapatra (B.B.A.LL.B, V semester), and Archisman Mitra (B.B.A.LL.B, III Semester) of the KIIT School of Law were members of the winning team. At the same event KIIT University also won the inter-university cricket tournament. Suvankoor Dash of KIIT School of Law was a member of the winning team.